توزنده جانی, حسین, سلطانی, زهرا, حسینی کردخیلی, سیدعلی. (1396). بکارگیری تئوری مکانیک شکست برای پیش بینی عمر خستگی ورقهای چندلایه متعامد. 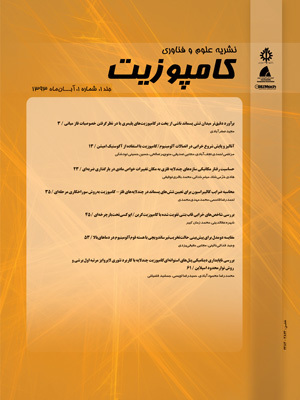 علوم و فناوری کامپوزیت, 4(1), 47-52. حسین توزنده جانی; زهرا سلطانی; سیدعلی حسینی کردخیلی. "بکارگیری تئوری مکانیک شکست برای پیش بینی عمر خستگی ورقهای چندلایه متعامد". علوم و فناوری کامپوزیت, 4, 1, 1396, 47-52. توزنده جانی, حسین, سلطانی, زهرا, حسینی کردخیلی, سیدعلی. (1396). 'بکارگیری تئوری مکانیک شکست برای پیش بینی عمر خستگی ورقهای چندلایه متعامد', علوم و فناوری کامپوزیت, 4(1), pp. 47-52. توزنده جانی, حسین, سلطانی, زهرا, حسینی کردخیلی, سیدعلی. بکارگیری تئوری مکانیک شکست برای پیش بینی عمر خستگی ورقهای چندلایه متعامد. علوم و فناوری کامپوزیت, 1396; 4(1): 47-52. در این مقاله از تئوری مکانیک شکست برای پیش­بینی عمر خستگی ورق­های چندلایه متعامد پایه پلیمری تحت بارگذاری متناوب استفاده شده است. در این رویکرد ابتدا سهم تنش در هر کدام از لایه­ها با استفاده از تئوری کلاسیک تعیین می‌شود و سپس با به‌کارگیری تئوری جنبشی شکست مقادیر پارامترهای خرابی در اجزای هر لایه یعنی الیاف و ماتریس آن به‌صورت جداگانه محاسبه می‌شود. با انجام این روند و به‌کارگیری مدل خرابی پیش‌رونده خواص الیاف و ماتریس کاهش یافته و به تبع آن خواص لایه‌ها تغییر می‌یابند. این امر سبب تغییر در سهم تنش هر لایه و در نتیجه تنش‌های فایبر و ماتریس می‌شود. به این ترتیب عمر چندلایه عمری خواهد بود که مقدار پارامتر خرابی الیاف یا ماتریس در تمام لایه­ها به مقدار بحرانی 1 برسد. در این رویکرد به‌منظور تعیین پارامترهای مادی موجود در رابطه تئوری جنبشی شکست برای ماده الیاف و ماتریس از نتایج تست‌های آزمایشگاهی روی لایه‌های تک‌جهته با زوایای 0 و 90 درجه استفاده می‌شود. ویژگی اصلی مدل ارائه شده کاهش چشمگیر میزان تست‌های آزمایشگاهی موردنیاز نسبت به روش‌های متداول است. به‌منظور اعتبارسنجی مدل حاضر، نتایج خستگی به‌دست آمده با نتایج آزمایشگاهی موجود برای ورق‌های تک‌لایه با زوایای مختلف و چندلایه متعامد مقایسه شده که تطابق بسیار خوبی بین نتایج مشاهده شده است. In this paper the kinetic theory of fracture is employed to predict fatigue life of composite cross-ply laminates. To this end, carrying stress in each layer is determined based on classical plate theory. Then using the rate dependent kinetic theory of fracture, damage index for constituents of each layer, matrix and fiber, are determined separately. According to these values, mechanical degradation model are applied separately for fiber and matrix material properties and the overall property of each layer will be updated. In this way carrying stress in each layer and consequently in fiber and matrix will be changed and fatigue failure is take place when value of fiber or matrix damage index in all layers of cross-ply laminated composite rises to the critical value. In this approach material parameters in fiber and matrix kinetic theory of fracture equations will be determined using experimental fatigue data for the longitudinal (θ= 0°) and transverse (θ= 90°) unidirectional, respectively. The huge advantage of this micromechanical model is reduction in amount of experimental test. Results from presented model show good agreement with experimental result presented by other researchers on cross-ply laminated composite plates. Pach, E. Korin, I. and Ipina, J.P., “Simple Fatigue Testing Machine for Fiber-Reinforced Polymer,” Experimental Techniques, Vol. 36, pp. 76–82, 2012. Reifsnider, K. and Gao, Z., “A Micromechanics Model for Composites Under Fatigue Loading,” International Journal Of Fatigue, Vol. 13, No. 2, pp. 149-156, 1991. Subramanian, S. Reifsnider, K. and Stinchcomb, W., “A Micromechanics Model For The Prediction Of Fatigue Characteristics Of Off-Axis Unidirectional Laminates,” Applied Composite Materials, Vol. 1, No. 1, pp. 69-74, 1994. Abdelal, G. Caceres, A. and Barbero E., “A Micro-Mechanics Damage Approach for Fatigue of Composite Materials,” Composite Structures, Vol. 56, No. 4, pp. 413-422, 2002. Mohammadi, B. Fazlali, B. and Madoliat, R., “Fatigue Life Prediction Of Symmetric Cross Ply Laminated Composite Using A Developed Continuum Damage Mechanics Based Model,” In Persian, Journal of Science and Technology of Composites, Vol. 2, No. 1, pp. 13-22, 2015. Huang, Z.M., “Micromechanical Modeling Of Fatigue Strength Of Unidirectional Fibrous Composites,” International Journal Of Fatigue, Vol. 24, No. 6, pp. 659-670, 2002. Huang, Y. Jin, K. Xu, L. Mustafa, G. Han, Y. and Ha, S., “A Micromechanical Methodology for Fatigue Life Prediction of Polymeric Matrix Composites,” 18TH International Conference on Composite Materials, 2011. Shokrieh, M.M. and Esmkhani, M., “Fatigue Life Prediction of Nanoparticle/Fibrous Polymeric Composites Based on the Micromechanical and Normalized Stiffness Degradation Approaches,” Journal of Materials Science, Vol. 48, No. 3, pp. 1027-1034, 2012. Qian, C. Westphal, T. and Nijssen, R.P.L., “Micro-Mechanical Fatigue Modelling Of Unidirectional Glass Fibre Reinforced Polymer Composites,” Computational Materials Science, Vol. 69, pp. 62-72, 2013. Adibnazari, S. Farsadi, M. Koochi, A. and Khorashadizadeh, S.N., “New Approach For Fatigue Life Prediction Of Composite Plates Using Micromechanical Bridging Model,” Journal of Composite Materials, Vol. 49, No. 3, pp. 309-319, 2014. Fertig, R. “Bridging the Gap between Physics and Large-Scale Structural Analysis: A Novel Method for Fatigue Life Prediction of Composites,” SAMPE 2009 Fall Technical Conference. 2009. Hansen, A.C. and Baker-Jarvis, J., “A Rate Dependent Kinetic Theory of Fracture for Polymers,” International Journal of Fracture, Vol. 44, No. 3, pp. 221-231, 1990. Kawai, M. Yajima, S. Hachinohe, A. and Takano, Y., “Off-Axis Fatigue Behavior Of Unidirectional Carbon Fiber-Reinforced Composites At Room And High Temperatures,” Journal of Composite Materials, Vol. 35, No. 7, pp. 545-576, 2001. Kawai, M. and Koizumi, M., “Nonlinear Constant Fatigue Life Diagrams For Carbon/Epoxy Laminates At Room Temperature,” Vol. 38, pp. 2342–2353, 2007. Herakovich, C.T. “Mechanics of Fibrous Composites,” First ed., John Wiley & Sons, Virginia, pp. 112-124, 1998. Huang, Z., “Tensile Strength Of Fibrous Composites At Elevated Temperature,” Materials Science and technology, Vol. 16, No. 1, pp. 81-94, 2000. Coleman, B., “Time Dependence of Mechanical Breakdown Phenomena,” Journal of Applied Physics, Vol. 27, pp. 862-866, 1956. Zhurkov, S. and Kuksenko, V., “The Micromechanics of Polymer Fracture,” International Journal of Fracture, Vol. 11, pp. 629-639, 1975. Hashin, Z. and Rotem, A., “A Fatigue Failure Criterion for Fiber Reinforced Materials,” Journal of Composite Materials, Vol. 7, pp.448-464, 1973.